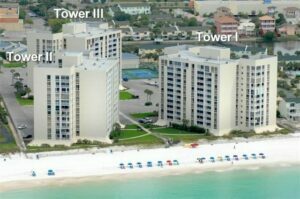 Shoreline Towers has both 2 beachfront condos and 1 Gulfview condo in Destin, FL. Below is a list of the Destin beachfront condos for sale with the most up-to-date information available on the internet. Click on a condo that you are interested in to get The most pictures, information and details about these Destin beachfront condos for sale. The most current MLS data is linked to each condo and is updated daily. The condos in the list below are actually pulled directly from Fort Walton Beach, Destin, Miramar Beach and Sandestin local MLS. For the most part people group all of these communities together as Destin. For more information on a condo for sale in Destin call Danny Margagliano at 850-830-4747. The two most popular pieces of property that are sold in the Destin area for vacation rentals, second homes and investment properties are beachfront condos and Gulfview condos. There are also two main reasons why this is. First, just about everyone that comes to our area wants to see our world-class beautiful white sand beaches and gorgeous Emerald colored Gulf of Mexico. The second reason also ties in to the first, because of this, most vacation rentals are booked with seeing the beach in mind.